In planning this meal, we referred to it as a “dim sum”, despite the fact that it didn’t really include any standard dim sum fare, and one of the dishes was really more Thai/Vietnamese than Chinese. (As a matter of fact, I’ve never even HAD dim sum. I love the idea of it, but my food allergies make me wary of any situation where I can’t feel sure of what’s actually in what I’m eating, and from what I’ve seen that has a lot to do with the dim sum experience.) Whatever you call it though, it was one of the most satisfying meals we’ve made in recent memory, not just because it tasted good (because it most certainly did) but because we learned how to make two new dishes that we were curious about, and finally succeeded at a dish we’ve been struggling with for ages. And yes, this was totally vegetarian. We’ve been experimenting more with meatless meals, in an attempt to save our grocery money for the really GOOD cuts of meat, and also to cut back on the amount we eat. Although we are really good about our vegetable intake and try to severely limit the fat, sugar, and carb content of our meals, we do tend to eat more meat than is really necessary or healthy. Cutting back a bit will hardly be a challenge when we can throw together delicious vegetarian meals like this! The first component of our dim sum was baozi, or Chinese filled steamed buns. I have never actually had baozi before, but have always thought that they sounded and looked delicious, so we finally bit the bullet and made them ourselves. Typically baozi seem to be filled with either bbq meat, soup, or sweet things like bean paste, but J made the filling for ours with shelled edamame, shiitakes, green onions, and carrots all chopped up and stir-fried in sesame oil and thin teriyaki sauce until softened and a little caramelized. The dough that I used for the wrappers was actually a naan dough from my current cookbook love, the Best-Ever Curry Cookbook by Mridula Baljekar. A typical baozi dough is much simpler, but as I was already making a batch of the dough to actually make naan later in the week I thought it would make a reasonable substitution. 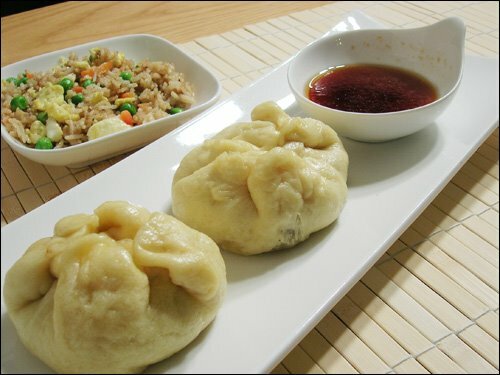 I added a bit of sugar and sesame oil to the portion of dough I was using for the baozi to enhance the flavor of the filling. I had some trouble actually filling the buns – the tops didn’t want to stay closed at first – but after two pseudo-failures (one of which looked fine when it went into the steamer but sort of exploded while cooking) I managed to put together two well-sealed buns. They went into the steamer for around 12 minutes and came out soft and fluffy with a lovely glossy skin. I loved the texture of these, the way the dough yields between the teeth and reveals the savory-sweet filling. I desperately want to make them with that ubiquitous char siu bbq pork filling now, though. 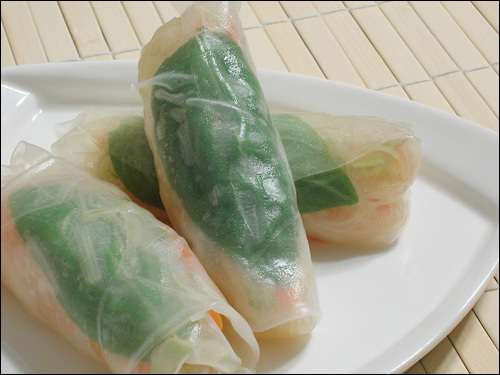 The second component were some vegetarian summer rolls, which couldn’t be easier to make once you’ve had some practice rolling. I filled them with shredded carrot, bell pepper, and cabbage, cooked rice noodles tossed with soy and sesame oil, and fresh basil leaves. To make the rolls, each rice paper wrapper got a quick dunk in some warm water to soften it, then got laid out on a flat board. I laid a basil leaf flat on the wrapper, then topped it with a small pile of noodles and a tumble of shredded veggies. The actual rolling was a bit tricky, but after the first one I think I got the hang of it – its just like wrapping a burrito, except with a very flexible, sticky, and fragile wrapper. The key is definitely to roll it as tight as you can without tearing, and as long as you use a gentle touch that’s fairly simple to do. These were so light and crisp and refreshing, the perfect counterpoint to the warm and hearty baozi, and totally delicious when dunked into a dipping sauce made from sweet chili sauce, ponzu, and rice wine vinegar. I think next time I’d use bean thread noodles rather than rice noodles, because the rice noodles were a bit too firm here, and I’d like to include shredded lettuce and bean sprouts next time, but even so these were a total winner. I think the basil is what sends this over the top – the heady aroma of fresh basil is just killer alongside fresh veggies and savory soy, adding a really complex note to an otherwise straightforward little roll. I can see myself making these a lot once the weather starts to get warmer – they’re just to quick and easy, and the package of wrappers I bought has a TON. I may also experiment with meat or seafood fillings – I know that shrimp or even pork can be fairly traditional, but what about a miso-glazed seared salmon, or a ground chicken satay filling? I bet I could have an entire summer roll party! But as good as these two dishes were, the real winner of the night was J’s fried rice, because this time it really WAS fried rice. I am ashamed to admit that I didn’t pay very close attention to how he made it, being preoccupied by my summer rolls, but this was exactly the kind of fried rice I’ve always hoped to be able to make at home and have always failed at before. Pre-cooked basmati rice (I know, you’d never expect it, but this worked incredibly well) stir fried with diced carrots and onions and a handful of frozen peas, simply seasoned with just a bit of soy and black pepper, and bulked up slightly with the addition of a scrambled egg, this was unspeakably perfect. The holy grail of fried rice. The kind of fried rice I could probably eat every day and never tire of. 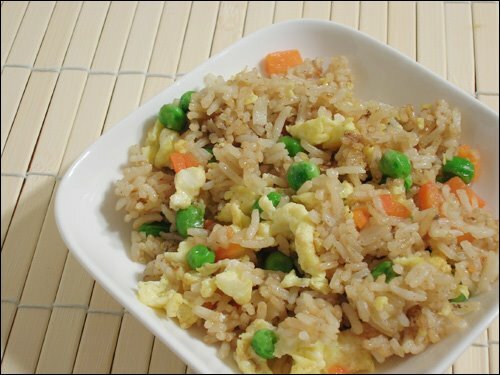 Which is bad because, lets face it, fried rice isn’t healthy. It takes a fair amount of oil to keep it from sticking to the wok in a hopelessly coagulated mess, and instead get crisp and toasty and delicious. But once in awhile, man is it worth it. 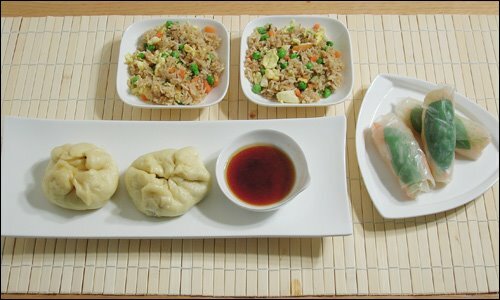 And so, J is now Fried Rice Man, and we are one step closer to making our favorite Chinese takeout meals at home. I think our next challenges will be orange/sesame/General Tso’s chicken (lets face it, they’re all pretty similar) and boneless spare ribs, though they may have to wait until we feel deserving of a treat. Or, you know, tomorrow. This entry was posted in Food, Drinks and Cooking, Table for Two? Archives and tagged asian, dinners, rice, vegetables. Bookmark the permalink.